After her victory in the battle with Mahishasura we celebrate Dasami the 10th day (9th day this year) as Vijayadasami, Vijaya means victory Dasami means 10th day. She is the mother of the world. She is the form of Lalitha tripura sundari devi. She appears on the 10th day sitting on the throne and holding sugarcane in one hand, and giving blessings to her devotees with a peaceful and beautiful smile. In Kanaka durga temple (vijayawada) she appears like this in the day time and in the evening there will be a boat festival in Krishna river, they bring the Goddess Kanaka durga utsava vigraham (a small idol of Kanaka durga devi) down, they decorate a beautiful swan shape boat with lights and place the Devi idol on it and make few rounds in the Krishna river and bring back the idol to the main temple this is called Teppotsavam. 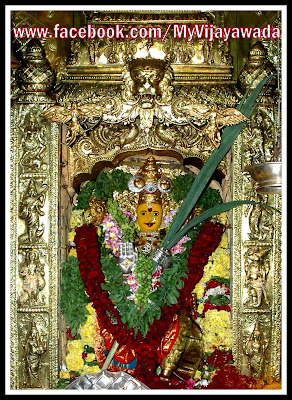 Dasara is a very important and famous festival in Vijayawada which is celebrated every year. Kanakadurga temple is the synonymous with Vijayawada. Special poojas are performed during dasara and also called durga navaratrulu.